Now this is time for sharing Chrome Web Browser and proceed with third part and 3rd Browser for this series. Chrome is very famous web Browser of World, which is property of Google Inc. Chrome is number 1 web browser of the World because it has maximum number of users all around the world after Mozilla Firefox. Previously, before release of Chrome! Mozilla Firefox was on Top with maximum number of users but now Google Chrome is on 1st Spot. So it is quite necessary to use this browser for showing or guiding Bookmarking features of it. As like Internet Explorer and Mozilla Firefox. This is the third and almost final part of Bookmarking Series. As you people know, I have already published two post regarding same Topic with three different web Browsers. Chrome is very fast web Browser and it will also Bookmark Websites very quickly to the Browser’s Toolbar that you can access them very easily with one single click. You may also save your entire bookmarks as backup before installation of new OS. Keeping backup is the feature which can restore all the Bookmarked links to your Web Browser once it’s backed-up or exported. ii. Now visit a website to bookmark it, and “Click” on Star located inside Address bar, as shown in image or use shortcut keys “Ctrl + D”. 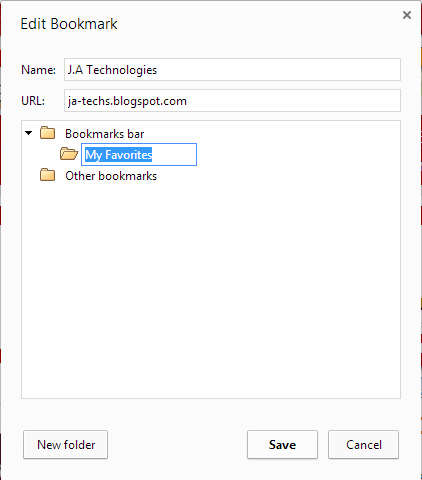 Ensure that “Bookmarks Bar” is selected from drop down menu of “Folder” then click on “Done”. See bookmarked website is placed on Bar. iii. For saving or bookmarking multiple URLs/websites in a folder/folders, Click on Star or use “Ctrl + D” as shown step II, and this time “Edit…” then click on “New folder” rename it and hit “Save” button. (Remember that New folder must be created under Bookmarks Bars) See below image. iv. 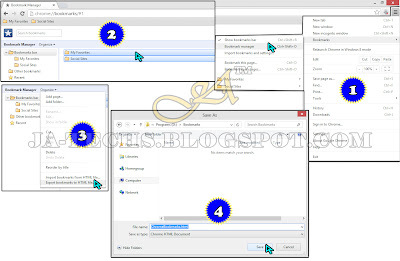 Perform step III for creating multiple folders. 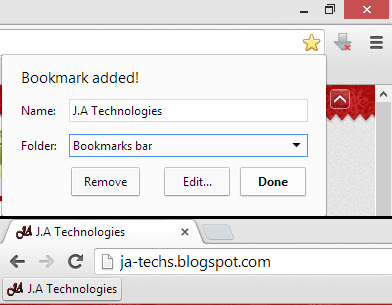 How to Export Bookmark in Google Chrome? 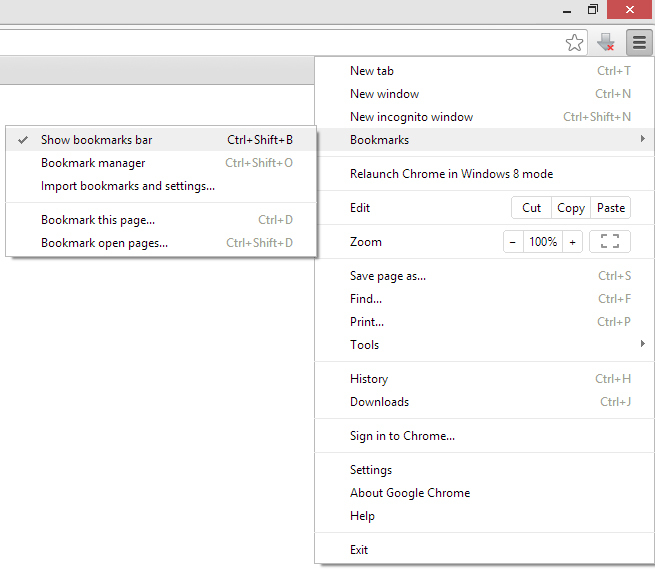 Go to "Option} Bookmarks} Bookmark manager" or use Shortcut key "Ctrl+Shift+O". 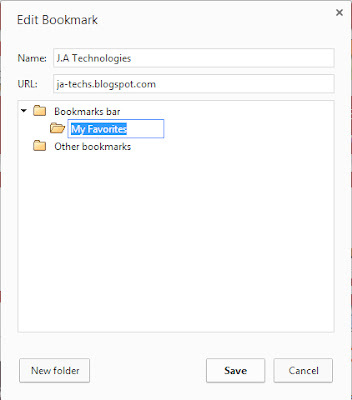 Select your desired Folders under Bookmarks bar to export them (Hold Ctrl key for multi-selection). 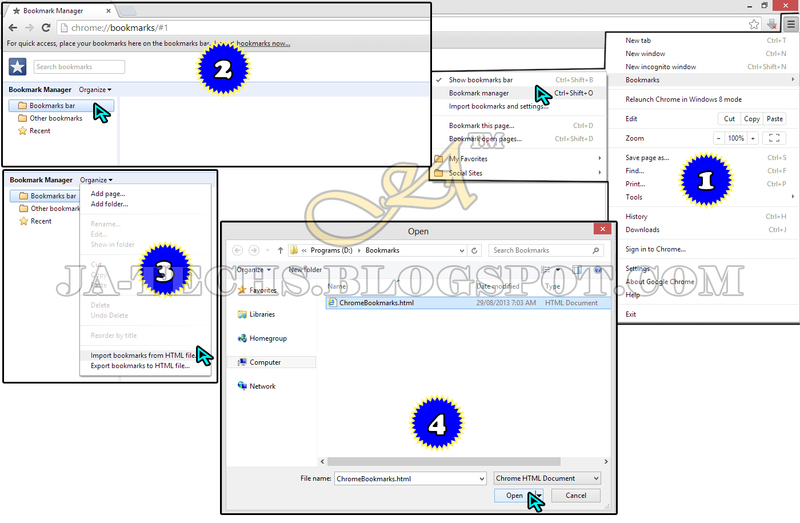 Click on “Organize} Export bookmarks to HTML file…”. Rename save file and Save it to anywhere except ‘Driver C:’. How to Import Bookmark in Google Chrome? Select “Bookmarks bar” by clicking on it. Click on “Organize} Import bookmarks from HTML file…”. Browse and locate the Bookmark saved file, then Click to Select and Hit “Open” button.